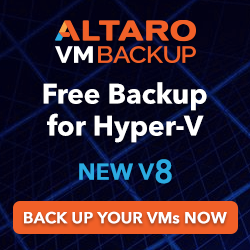 It’s been a very busy year for a couple of MVPs that are writing about Hyper-V.
Windows Server 2012 Hyper-V offers greater scalability, new components, and more options than ever before for large enterprise systems and small/medium businesses. Windows Server 2012 Hyper-V Installation and Configuration Guide is the place to start learning about this new cloud operating system. You’ll get up to speed on the architecture, basic deployment and upgrading, creating virtual workloads, designing and implementing advanced network architectures, creating multitenant clouds, backup, disaster recovery, and more. The international team of expert authors offers deep technical detail, as well as hands-on exercises and plenty of real-world scenarios, so you thoroughly understand all features and how best to use them. Help make your Hyper-V virtualization solution a success with Windows Server 2012 Hyper-V Installation and Configuration Guide. A complete step-by-step Hyper-V deployment guide, covering all Hyper-V features for configuration and management best practices. Understand multi-tenancy, flexible architecture, scalability, and high availability features of new Windows Server 2012 Hyper-V. Learn Hyper-V Replica, Hyper-V Extensible Virtual Switch, Virtual Machine Migration, Hyper-V Storage, Hyper-V Failover Clustering, and also System Center VMM and DPM for management, backup, and recovery. Over a short span of time, server virtualization has been one of the most rapidly adopted technologies in IT business. Microsoft Hyper-V is a hardware-assisted hypervisor product, available as a server role in the Windows Server operating system. Windows Server 2012 Hyper-V provides cutting-edge server virtualization features for a scalable, flexible, and highly available virtual machine infrastructure. “Windows Server 2012 Hyper-V: Deploying Hyper-V Enterprise Server Virtualization Platform” is a comprehensive guide, which starts itself from basic virtualization and server consolidation concepts, and then goes deeper for discussing advanced topics, such as a Hyper-V scalability, failover, and virtual machine migration. This book is an ideal choice for those who are stepping into Hyper-V world, and also for those who are experts in Hyper-V and want to advance their skills with the new Windows Server 2012 Hyper-V. This book contains topics starting from introducing Hyper-V as a hypervisor, and then moves ahead with covering advanced topics, related to Hyper-V configuration and virtual machine management. The book starts with getting to know Hyper-V, and then we discuss planning, designing, and the implementation of Hyper-V. It then goes with advanced topics such as Hyper-V Replica, Hyper-V Networking and Storage, Hyper-V High Availability, and so on. “Windows Server 2012 Hyper-V: Deploying Hyper-V Enterprise Server Virtualization Platform” is an expert guide for discussing Hyper-V configuration and management topics. It’s a pleasure to announce the release of my Windows Server 2012 Hyper-V Cookbook. As the first and only available Hyper-V 3.0 book at the moment, the idea of this cookbook is to help you to become a Hyper-V expert with a easy to ready and follow recipe format that will guide you thought all Hyper-V features. All recipes give you the introduction of the content being discussed, the “how to” process and the section “how it works”. Another interesting thing about them is that almost all recipes have PowerShell commands and examples to help you to automate the Hyper-V management. Virtualization has proved that it can help organizations to reduce costs, and the Private Cloud has created a revolution in the way we manage and control our servers with centralization and elasticity. The new Windows Server 2012 Hyper-V release from Microsoft comes with a myriad of improvements in areas such as mobility, high availability and elasticity, bringing everything you need to create, manage and build the core components of a Microsoft Private Cloud for virtualized workloads. “Windows Server 2012 Hyper-V Cookbook” is the perfect accompaniment for Hyper-V administrators looking to take advantage of all the exciting new features the release has to offer. Through practical recipes, you’ll master Hyper-V deployment, migration and management. “Windows Server 2012 Hyper-V Cookbook” is an essential resource for any Hyper-V administrator looking to migrate, install and manage their virtual machine efficiently. With all the features of Windows Server 2012 Hyper-V covered, you will learn everything from installation to disaster recovery, security, high availability, configuration, automation, architecture and monitoring, all in a practical recipe format. The book also includes new features such as Storage and Shared Nothing Live Migration, Hyper-V Replica and Network Virtualization and much more. With “Windows Server 2012 Hyper-V Cookbook” in hand, you’ll be equipped to manage your Private Cloud with ease. The good news is that Chapter 2 is available to download so you can have a look at the book concept and also be ready to migrate your current servers to Windows Server 2012 Hyper-V. To download the chapter, click here.